I have checked my credit report and I have a Poor credit score, what is minimum credit score to get a mortgage? My first piece of advice – “Ignore the score” – nice and simple, it even rhymes so it is nice and easy to remember as there is no set minimum credit score to get a mortgage. If not the score, what are we looking for? Payment History – This is where you can see your payments being made each month. Ideally you want this to be displayed in Green and/or as a “0”. If it is anything other than this where a payment it due, it either means a payment was not made or not made or time. 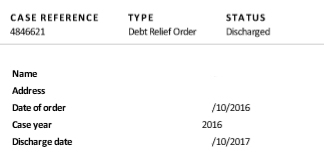 You can see from the example below, this Mortgage went up to 2 months in arrears on a couple of occasions. 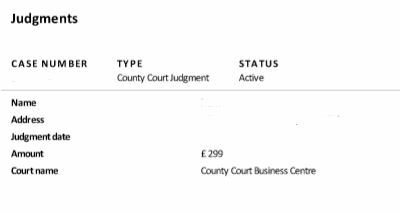 County Court Judgements (CCJs) – This section will display any CCJs you have had issued, the dates, the amounts and whether or not they are outstanding. Insolvency – This section is in relation to Bankruptcy/Debt Relief Orders/IVAs etc. In the example below it shows a DRO. This confirms the date of entering the DRO and the date of leaving. You can see then that none of the sections we look at are the credit score. The easiest way I can explain why the score the credit agencies give you are not really worthwhile is that when Banks and Building societies score your application, what they are doing is taking the information (the examples provided above) from your credit report and combining that with the information from your application, things that do not show on your credit report – income, number of children etc – and then combining the 2 and scoring your application based on their own scoring system. Why is there a credit score then? I have no idea! At best it is an indication of whether you have a good credit report or not. But aside from that, I suppose it keeps people signed up each month so they can see their score (hopefully) improve. We have seen people with defaults have scores of 999 and then people with no defaults have average scores – the scoring methods they use has us stumped. The other thing to bare in mind is that even if you do have an excellent score, it does not mean you will be accepted. As mentioned above, you can have an excellent score and a default. The default may mean you do not fit the lenders criteria and so despite the score, it would be a straight decline. If you would like us to take a look over your report and discuss your options, please get in touch where we will be happy to take a look. Next Post:Mortgages and the difference between Freehold & Leasehold?